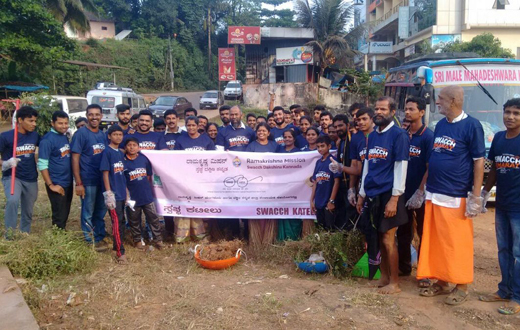 Mangaluru, Nov 26, 2017: Ramakrishna Mission Swachata Abhiyan’s 4th week’s drive was carried out opposite Cascia High School in Jeppu area on 26th November. Captain Ganesh Karnik, Chief whip of opposition in Legislative council and Everest Cresta, Headmaster of Cascia High school flagged off the drive in the presence of Swami Jitakamanandaji, senior monk of Sri Ramakrishna Mission. The students of Cascia High school cleaned the wall surrounding Cascia High school and the adjoining drains. Members of Nivedita Balaga removed the dirt & sand lying on both sides of the road and was posing problems to pedestrians & motorists alike. The students of S Madhusudan Kushe visited homes door to door distributing the handbills on awareness. The space earmarked for footpath in front of Cascia high school had become place to dump garbage due to poor maintenance. Neither the students nor the pedestrians could use the road due to this menace. The place also was stinking. Hence for the past 2 days, efforts were on to remove the dumped garbage using tipper. About 4 loads of dumped garbage and dirt were removed from the spot. Today Interlock tiles were laid in that spot to create a footpath. In the coming days, flowering plants will be planted. Members of Hindu Warriors cleaned the bus shelter in the Marnamikatta area. They also painted the shelter thus beautifying it. Using labour concrete bed was prepared and the area was levelled for the benefit of the public. Circle in front of the shelter was also painted thus giving it a facelift. More than 100 banners and posters in Jeppu, Mangaladevi and Moragns Gate area, that were ruining the beauty of the city were removed under the guidance of Sri Shyam Sudarshan Bhat by the member sof Swacch Puttur team. Swacch Manas Abhiyan: Under Ramakrishna Mission Swachchata Abhiyan, Swacch Manas Abhiyan is going on in Mangalore and nearby area. In the last 20 days Swacch Manas Awareness talks and interaction programmes were carried out in nearly 73 high schools. Nearly 6988 students are benefitted by this abhiyan till date. Lal the students have been given the badge of “Swacchata Senani”. Nearly 60 resource persons are visiting schools and are trying to create awareness among the students. This drive is being guided by M R Vasudev, Former director of Mangalore Airport. Nearly 101 schools have registered for this programme and Ashrama is targeting to reach about 10500 students with the programme, said a release from the Ramakrishna Mission. It is not just by cleaning a week we will be able to clean the city .The co-operation of the public is very important.